The latest trend in urban design and planning gets them off of the paper and out of a big room, testing ideas in the real world. It is fun and hands-on, and making many converts. In between the planning and the realization of a complete community vision is a stage of testing ideas in the real world, and that is what tactical urbanism is all about. Temporary bicycle lanes and public spaces, traffic calming for a day or a month, colorful crosswalks, turning parking lots into pop-up parks—such activities are taking place across America, formalized by techniques and strategies called tactical urbanism. This concept gets planning off of the paper and out of a big room and it is one of the most exciting trends in urban design and transportation today. Public Square editor Robert Steuteville interviews Anthony Garcia and Mike Lydon, principals of Street Plans and co-authors of the book Tactical Urbanism: Short-Term Action for Long-Term Change, to discuss the tactical urbanism trend. Can you describe the connection between Tactical Urbanism and New Urbanism and the difference between the two? Lydon: Tactical urbanism is really a methodology for private implementation and advancement within larger new urbanist projects. Tactical urbanism is a way of thinking and doing this that's been around for a very long time. Early examples can be found at Seaside, where temporary buildings, markets, and public spaces were used to drive interest and vitality. It’s an opportunity for people to engage in change-making that is critical to the success of our longer-term project. So I'd say it's a tool. It's a part of New Urbanism, always has been, and should remain that way moving forward. Garcia: I think the big difference is that with Tactical Urbanism, you're really looking to build something—it brings the ideas that we put down on paper to life. It springs from the idea that walkable, compact communities are what we should be doing, and how do we get back to that goal? Tactical urbanism short-circuits the normal process of the charrette and builds on it in a way that is not obvious to most people who are not new urbanists—but the whole idea of “test before you invest” is analogous to a charrette, it's analogous to doing sketches after sketches on a site to try to get to some sort of a solution. That’s what urban designer Victor Dover calls, "Propose and dispose." The charrette is all about hashing out those ideas on paper. And our work just takes it another step further and says, "Why stop at the paper? Why stop at the rendering? Let's just build the thing and see if it works." You talk about this as having a history, but nobody really identified it as a specific concept 50 years ago or 100 years ago. Why has it come into the lexicon now? Lydon: A lot of these ideas have just been isolated in their application. It's powerful to take an idea to fruition very quickly, and whether it fails or succeeds, just the notion of doing it, for some reason, seems radical or strange or not the way that projects are normally developed. There's a lot of examples of activating streets or spaces or people doing things without permission and those things leading to sustained and sanctioned change at the policy level, or through physical projects. There’s a fascinating history of this as a form of protest in the ‘60s and early ‘70s. For us, writing this book a few years ago, it was really important that we pay attention to that, and give credence to the fact that this isn't new. But this term, in bringing all these disparate projects together that more or less use the same line of thinking perhaps is the new element here. And you see it today as a matter of necessity in developing cities in developing nations. You see it in favelas, or in just normal city neighborhoods, a lot more of this reclamation of space, and making good use of what you have on hand, and trying things out, and a lot of low-risk, small-scale projects and enterprises that, when successful, make a lasting impact. Garcia: And they arguably don't call themselves tactical urbanists. The favelas—that's just the way that they do it. We branded it, but the reason that you don't see any mention of it throughout history is for the same reason you don't see New Urbanism mentioned. It's just the way things were done. And there was no reason to call it out as being different, but now there is. Why do you think the concept has resonated in cities and towns throughout the United States and abroad? Lydon: People are tired of conventional planning process. There's only so many public meetings that folks want to go to. And this puts the action squarely into the hands of folks—city people, city employees, and city leaders, and citizens. And that's the powerful framework that’s inherently about doing as opposed to talking about or planning doing something. It's very action-oriented, it's low cost. For the most part, it's extremely fun to go and change a space with groups of people. That action approach has really brought a lot of attention and excitement, and that's part of the appeal. I was just at the charter awards jury, and there was a call for some tactical projects, and a number of them deal with streets. Is there a special reason why streets in particular are in need of tactical urbanism? Garcia: There's two reasons that streets are easier for us to do. Like I was just mentioning, a building is a more complex thing. The larger-scale items are just harder. But street interventions are a lot more accessible, and it's a place that we all feel comfortable with as new urbanists. A street is easy to retrofit. But the sad part is that we need to retrofit them because our streets have been so horribly designed, and continue to be horribly designed, up to today. And I think that's one thing that we as new urbanists have learned, the buildings can only do so much. They can only carry a certain part of the load, but what happens between the buildings is just as important. And we're losing that battle. So people see that as being the front line, and that's why we see a lot more projects on streets. Lydon: There's an ownership level here, right? We can eventually get permission or claim that we have ownership over the streets as taxpayers, to work with them, and buildings and lots are private space. So if you have a willing property owner, it’s very easy. But we can also do blocks and blocks of public right of way by working with cities. And as Tony mentioned, it's public realm that has been so lacking in the American city in the last several decades and for all the reasons new urbanists highlight. And to fix the street is absolutely primary to our work. What are some of the more successful and/or innovative tactical urbanism projects that are going on right now? Garcia: A project that's going on right now that is pretty innovative is Biscayne Green. This is a highway median that goes right into downtown and the median is a series of parking lots. So the Downtown Development Authority got a grant from the Knight Foundation to convert two of the parking lots into public space. 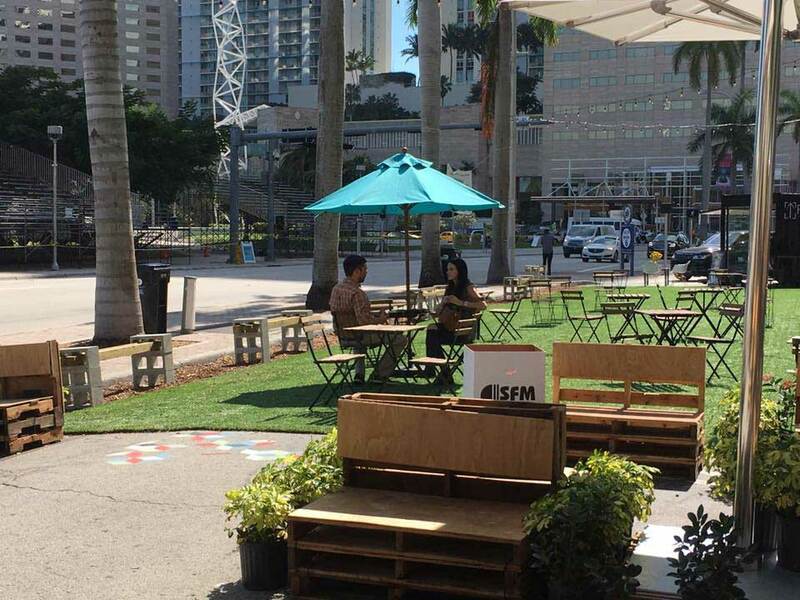 The innovative aspect is that we reconfigured Biscayne Boulevard, which is our main street here in South Florida, right on the bay, to allow on-street parking. As part of that exercise, we also negotiated with FDOT (Florida Department of Transportation) to paint crosswalks with an artistic design, something that they had not allowed anywhere in the state of Florida up until this point so this experiment is not just a Pavement to Parks project, it's got a crosswalk component. It's got a dedicated bus lane component. So it's all of these tactical projects mashed together in an ensemble. When you put it all together like this, it's a pretty massive undertaking and it's starting to scale up in the way that we have envisioned. Lydon: We just finished a project in northwest Arkansas, where our charge was to work with three cities—a nonprofit was our client along with the Walton Family Foundation—and our task was to come up with pop-up bike lanes that would last for one month. That's also interesting because we haven't really seen many interventions that last for that amount of time. The fun thing was that our municipal government partners, at least at the Municipal Planning Organization level, were skeptical at first and not really accustomed to this whole idea. Now I would say Tim Conklin, our client, is one of the best tactical urbanists that we know. He gets it and that change happened in front of us. What was so convincing in what you did with the government partners that changed their minds? Garcia: It wasn't what we did. It was what he did because he got his hands dirty. Michael, tell the story. Lydon: Well, first of all, just to zoom out quickly to have context on the project. The point was to create three protected bike lanes radiating off of a trail network. They built a 35-mile world class trail network through northwest Arkansas. But the problem is they had no on-street connectivity to the trail through the downtown, so the charge was to build protected bike lanes connecting major destinations to the trail, including downtown. The moment the client has traffic tape in his hand, on his hands and knees, and is putting it down on the asphalt with the mayor, he looks up and says, "Okay, guys, this is pretty cool. I get it." That’s the ‘aha’ moment. There's something powerful and fun and collaborative about actually doing a project together physically that's very, very different than drawing something on paper or being at a public meeting. The next step in this line of thinking is to actually allow citizen groups, nonprofits, and city departments to do this as a right. What we found in Burlington Vermont is that we can stitch these things together to allow businesses and organizations to take this approach and start implementation very early on in the process. So you're going from plan to action, from paper to pavement very, very quickly. In Burlington there were four demonstration projects on one weekend that got thousands of people involved and built a lot of excitement. It provided a test case for a permit program and policy that the city adopted and now allows organizations to make tactical changes whether we're there or not. It's the local community groups who go to the city and have a very clear process to get permission to do a range of projects and interventions in public space and the street. That's the very first time any community, any city that we know of in the United Sates, has done that. Do you know if anybody's followed up and taken advantage of this program? Lydon: The first to step in was an organization called Local Motion. It is a statewide advocacy group in Vermont, based in Burlington. Once we got the policy adopted this past Fall, they went out and got a trailer full of materials so they can drive around the city or the state and do all these pop-up demonstration projects. So they've now assembled that and are starting to drive around, but it's really going to be the spring and the summer when all this gets rolled out. And we're just now finishing the master plan for the city of Burlington. It's going to a formal approval process this winter. What sort of materials do they have in the back of this trailer? Lydon: It would be planter boxes, cones, traffic tape, the tools for implementing—so things like scissors, paint, paint brushes, wood—that can be configured into different things. This whole kit of materials will always be evolving depending on what the project calls for. Let me ask you about two things that I think are absolutely critical. The first is testing. You're doing this for a short period of time. How important is the concept of testing and getting numbers before, during, and after to prove any particular concept? Lydon: It's critical because it helps you build a story, build a case with the community to accept and engage in a project. And then you really demonstrate success through real pictures of people using space, numbers of users, public reviews, comparison of crashes, or whatever the metric might be. Garcia: Just having built the thing is a test. That is a proof of concept. A rendering in real time. The other thing I wanted to ask you about is liability. I'm sure you get these questions all the time. There are concerns about changing the street, changing the space. How important is liability and how big of an issue is it? Garcia: We try not to focus too much on the liability aspect because that's part of what got us into this problem in the first place. Constant focus on liability and who is going to get sued has led to our streets being designed by the lowest common denominator. Lydon: It is a concern fairly frequently, but it's a thing we can deal with pretty expediently. When we are talking about changes to the right of way, oftentimes we're doing things that are already done in materials that are already used by Public Works Department or Department of the Transportation. Things like cones and traffic tape are part of the normal language of construction projects. So we take those tools and we're just remixing them and applying them for a different purpose, in terms of the testing. They're often willing to use their own liability to cover the project since it's sanctioned. Where I think liability becomes a concern is in the unsanctioned projects that don't have permission from the city. Those things might be done in a guerilla fashion. And if you're doing something in the middle of the night, without permission from the engineers, then you need to be able to accept that liability. The great irony is that the vast majority of projects are actually using geometries and designs that inherently make streets safer. So this is why you've never seen anybody get hurt in a major way, or killed, on our streets project during hundreds and hundreds if not thousands of pilots and demonstration projects of tactical urbanism around the globe. 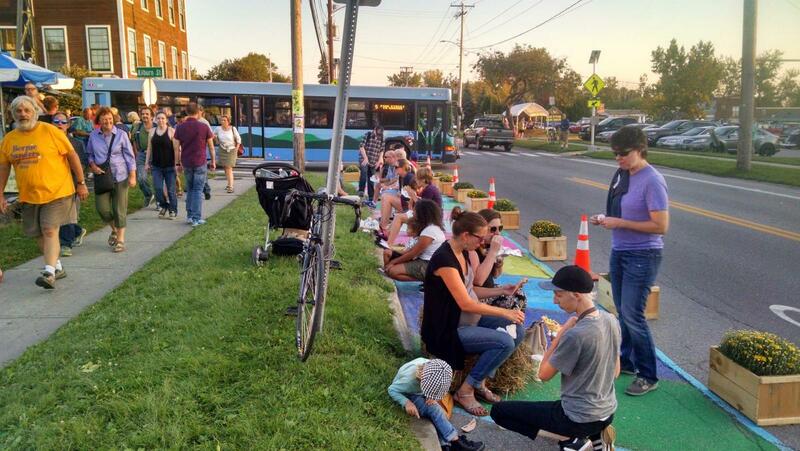 What differentiates the communities that are using tactical urbanism and those that aren't? Can you tell me what is triggering this in some places and not in others? Garcia: There's usually an organized group of people who are interested—ideally, it's inside city hall and outside where there is some education or some advocacy group. When you got those two forces together, it's a very, very powerful tool because there's political cover coming from both ends. Those communities tend to be a little more educated, higher income possibly. One of the challenges with this idea is that volunteers need free time to make these projects happen. So there's an unspoken prerequisite that you need to have the capacity of an engaged community. Now that being said, of course there's been lots of projects where that isn't necessarily the case. You see a lot of communities that are underserved, under-resourced, using this as a means of getting things done at low cost to create momentum and progress in overlooked places of the city. And I think that's where we want to spend a little bit more of our energy and time in focusing on how this tool is used within those places. It can be a great way to attract political attention and capital to move ideas. It’s often a city location, an urban location, where the tactical urbanism is applied. Are you seeing this in the suburbs very much? Lydon: We've worked in suburban locations. The reason why I think we see it more in an urban setting is an issue of scale. You don't have the urban armature to frame the public realm, so the project becomes harder to instigate. We've worked on those and quite frankly, they're just harder to be successful because you just don't get the sense of a human scale as easily. But yet they probably need it even more. Garcia: I would agree. Where tactical urbanism and New Urbanism meet is in the action that you take on the ground as a way to inform the policy and the zoning and the regulatory side that actually empowers the water colors and the renderings to become real. So if you're taking a large vacant site and you're activating it, then you're showing demand and interest and the viability of concepts. It's a tool that can show property owners, businesses, city leaders this stuff is actually doable and viable. I heard this week that a pervasive engineering mentality is the biggest problem in America related to the built environment. 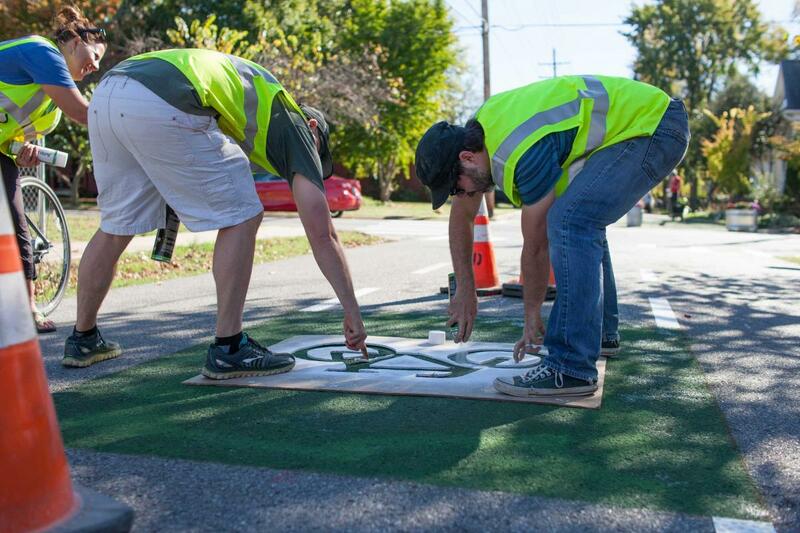 Are you seeing tactical urbanism being accepted and applied by departments of transportation? Lydon: Slowly. I mean the ideas became a lot more accepted generally with progressive engineering departments, DOTs, and public works. You see it in the big cities, for sure. It's a career-long fight that we're engaged in. But we've seen the Institute for Transportation Engineers write articles about tactical urbanism. We're seeing more and more cities adopt the NACTO Street Design Guide as their standard. We’re seeing it happen a lot with generational shifts. Many of the clients that we have are people who are our age, like the young directors of transportation in cities like New Haven. It's going to take time to filter its way up to the top of these departments, and to change the standards on the ground. And that's something that I credit new urbanists traffic engineers for pushing and making happen since 35 years ago. Looking toward the next decade, what is the role of tactical urbanism and where and how can it be most effective? Garcia: I think starting to infiltrate the public works departments. That's where we want to take our tactical urbanism fight. I think that having city staff buy into this idea is critically important, just like having city planning staff buy into New Urbanism was critically important to that rise and that change over the past 20 years. Lydon: That's one of the biggest reasons why we wrote the Tactical Urbanists' Guide to Materials in December, which was funded by the Knight Foundation. We wrote into that grant a series of workshops specifically where the engineers had to come to the table with the planners and the advocates. The idea is we want all these people in the same room doing a workshop around a problem site where tactical urbanism could be applied. We only selected cities that had their ducks in a row to move forward. They can get comfortable with the fact that they can do a lot more through this approach. The application's much wider than street safety, but that's kind of the reason for the guide creation and setting it within public works and the departments of transportation around the country. And we look at three different time intervals in that guide. We're looking at the materials and the design considerations for short-term, one-day to seven-day projects, medium-term projects of a month to a year, and projects that last one year to five years. Garcia: For our audience, I want to make sure there's a connection that we talked about early on that this is a movement by new urbanists. It's got its different approaches and audiences but I think it's born from this larger movement that we trained under. We think that's a really powerful addition to the new urbanist toolkit. And something that might get lost in the whole tactical urbanism discussion is there’s a plan that backs up what you're doing. We differentiate guerilla urbanism from tactical urbanism by the plan. Lydon: It's so important people understand that the best projects are those that are tied to the feasibility of doing something in the long term. If you're not tying the one day project to the long-term investment then it's not tactical. It's not achieving a larger outcome.